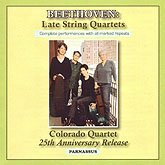 The Colorado Quartet celebrates its 25th anniversary with newly-recorded performances of the late Beethoven String Quartets. The three-disc set is the second release in a cycle of Beethoven Quartets, to be completed with release of the Op. 18 Quartets in 2009. These performances, like all Beethoven Quartet performances by the Colorado Quartet include all repeats marked by Beethoven in his scores. The performance of Op. 130 follows Beethoven's wishes by using the Grosse Fuge as its finale, adding Beethoven's second finale as an encore. The Colorado Quartet's members are violinists Julie Rosenfeld and Deborah Lydia Redding, violins; Marka Gustavsson, viola; and Diane Chaplin, cello. Since 2000 the Colorado Quartet has been Quartet-in-Residence at Bard College, where it gave frequent performances in addition to its touring schedule. The Quartet is also a regular ensemble at the Mostly Mozart Festival. It has often performed complete cycles of the Beethoven Quartets, including one in Berlin in the Fall of 2001.